For the vegetarian, vitamins and other trace nutrients are of special concern. The following information will help guide you toward a healthy vegetarian diet complete with essential vitamins. Vitamin B12 - is needed for red blood cell formation, growth, and a healthy nervous system. Unfortunately, inadequate vitamin B12 absorption can cause significant damage before symptoms occur so it's important that anyone on a vegetarian diet get more than enough of this vitamin. Vitamin B12 is found primarily in meat, dairy products and eggs and is absent from plant foods. With the vegetarian in mind, considerable research has looked into possible plant sources of vitamin B12. Fermented soy products (such as miso and tempeh), seaweed (kelp) and algae (spirulina) have all been proposed as containing significant amounts of B12. However, the present consensus is that any vitamin B12 present in plant foods is likely to be in a form unavailable to humans - so these foods should not be relied upon as safe sources. Foods fortified with B12 may be a good source in the vegetarian diet if you absorb oral vitamin B12 readily. Those foods would include fortified soy milk, breakfast cereals, veggie burger mixes, nutritional yeast and herbal soft drinks. Read labels carefully to ensure that you're getting the daily requirement of this important vitamin. Vegetarians who don't consume dairy products or eggs (and some who do) may need to supplement with vitamin B12. Sublingual B12 is the easiest version to absorb, although some people with absorption problems may require injections. Those without absorption problems can usually get what they need with multi-B vitamin supplements (read the label to make sure B12 is included). It's a good idea for new vegetarians to consult their physicians after the first 6 months to have blood levels of vitamin B12 measured (and possibly iron, also) and to discuss possible absorption issues. Vitamin B2 - Riboflavin - Studies have found that some vegetarians have a low intake of riboflavin (B2). Vitamin B2 is important in converting protein, fats and carbohydrates into energy, and for the synthesis and repair of body tissues. Good sources of riboflavin include whole grains, mushrooms, almonds, leafy green vegetables and nutritional yeast. The vegetarian will be happy to know that vitamin B2 is usually included in multi-B vitamin supplements. Vitamin D - is needed for the absorption of calcium and phosphate and necessary for healthy bones and teeth. It's found in dairy products and margarine, which is a good way for vegetarians to get enough of this vitamin. It's also produced by the action of sunlight on the skin. The elderly, young children and anyone confined indoors may need to consider a vitamin D supplement especially if they are vegetarians who don't consume dairy products. Iron - is a mineral that is an essential component of hemoglobin (which transports oxygen in the blood through the body). Iron deficiency is one of the most common nutritional problems, regardless of the type of diet. Research shows vegetarians are no more likely to develop iron deficiency than meat-eaters, perhaps because they tend to be more aware of this issue. Iron is found in leafy green vegetables, legumes, wholegrain bread, dried fruit, pumpkin seeds and molasses. However, plant based iron (non-heme) is not digested as well as iron coming from meat (heme). Vitamin C supplementation can vastly improve absorption. The absorption of non-heme iron can be improved when foods that enhance iron absorption are included in the same meal. While some foods can enhance iron absorption, others can inhibit or interfere with iron absorption. Vegetarians should avoid eating inhibitors along with iron-rich foods in order to maximize iron absorption. Vitamin C supplements can also increase iron absorption for the vegetarian. A daily iron supplement can make things easy for those on a vegetarian diet. Fruit - oranges, orange juice, cantaloupe, strawberries, grapefruit, etc. Calcium - is necessary for building and maintaining strong bones and teeth, proper muscle contraction and blood clotting. It's found in dairy products, leafy green vegetables, watercress, tofu, almonds, sesame seeds, dried fruit, legumes and fortified soy milk. Some breads and juices are fortified with calcium - it's important that the vegetarian read labels to determine how much. Hard water can also provide significant amounts of calcium for the vegetarian diet. Zinc - plays a role in a wide range of enzyme systems and is essential for DNA metabolism and growth. Vegetarian diets tend to contain less zinc than meat-based diets. It's found in sesame and pumpkin seeds, green vegetables, cheese, lentils and wholegrain cereals. Iodine - is necessary for the production of thyroid hormones important to metabolism. It's found in milk (used as a disinfectant in milk production), kelp (seaweeds) and seafood. The amount in plant foods depends upon how much is available in the soil in which the plants were grown. The prevalence of iodized salt makes iodine deficiencies rare. Vegetarians on low-sodium and all-natural diets (whole food products are often made with non-iodized salt) may not be getting enough iodine. Essential Fatty Acids - There are two essential fatty acids which must be supplied by the diet. These are linoleic acid and a-linolenic acid. Essential fatty acids are important for cell membrane function, cholesterol metabolism and the synthesis of various metabolites. Good sources of essential fatty acids are vegetable oils. It is important to have the correct balance between linoleic acid and a-linolenic acid. It has been suggested that vegetarians should use soybean or rapeseed oils rather than sunflower or corn oils as these help give a better dietary balance. It's important to be aware of these 'vegetarian vitamins', but don't let the fear of deficiencies keep you from choosing a vegetarian diet. Planning and attention to meal planning is important no matter what diet you choose. One factor to be aware of is that no amount of good nutrition will help if you're not digesting food properly. Digestion aids can help your body make the most of what you eat. 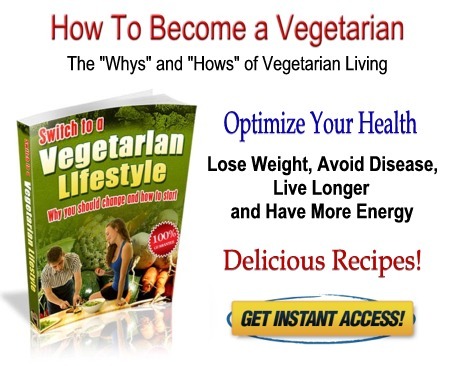 Now that you're aware of the special vitamin needs of vegetarians, you are well on your way to a healthy vegetarian diet. And remember, a good multi-vitamin and mineral supplement can add welcome insurance to you new vegetarian diet lifestyle.